Easy lace pattern shows off this delicate laceweight mohair. Kit contains 2 skeins of Naturally Mist (80% super-fine kid mohair, 20% nylon) and pattern. 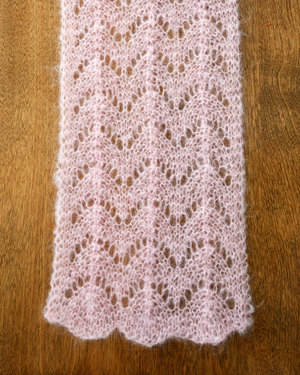 Will make a scarf approximately 7" wide by up to 80" long using a size 9 needle.